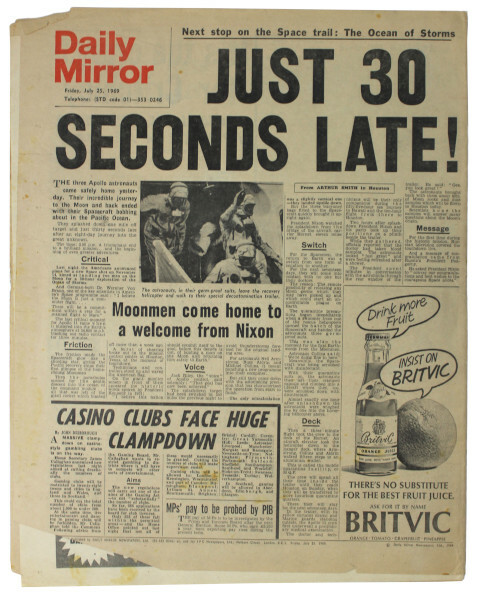 Original copy of the Daily Mirror from 25 July 1969, the day after Apollo 11 returned to Earth following the historic first Moon landing. 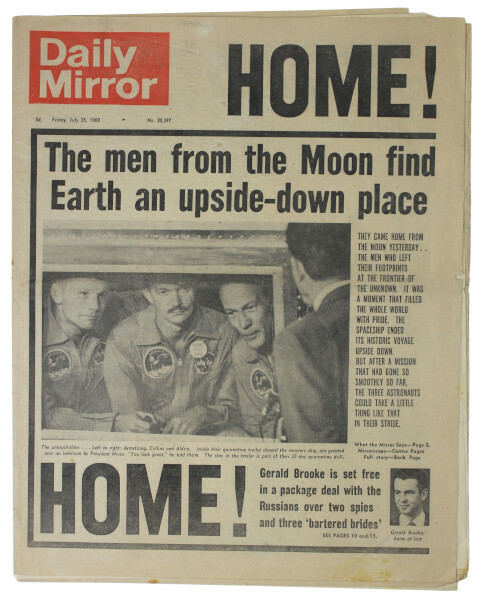 The image on the front page shows Neil Armstrong, Michael Collins and Buzz Aldrin in quarantine aboard the recovery ship speaking with President Nixon. The headline, “The men from the Moon find Earth an upside-down place” refers to the fact that the spacecraft splashed down in the Pacific Ocean upside-down. Luckily, the three buoyancy bags fitted to the spacecraft managed to quickly right it, making the wait for the recovery team much more comfortable for the three astronauts inside. The other story that shares the front page is also about a homecoming. Gerald Brooke, a British lecturer, was returned home after spending four years in Soviet custody for distributing anti-Soviet literature. His release was part of an exchange for Soviet spies held in Britain. The article is a reminder of the Cold War climate in which the Moon landings took place.